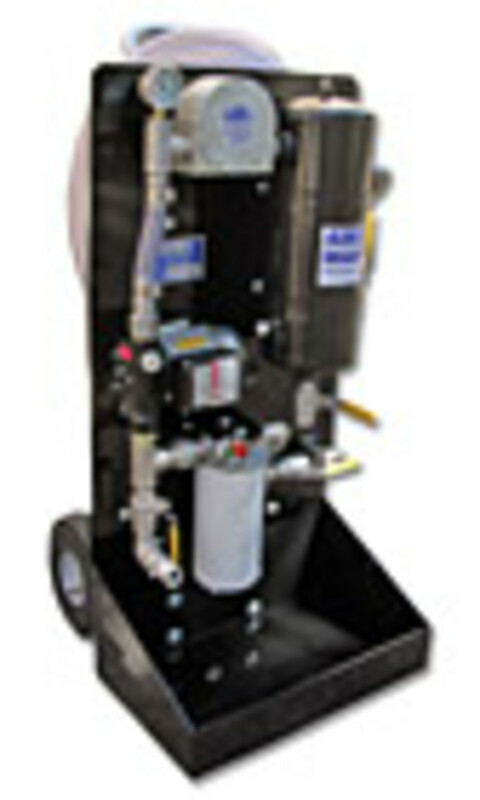 The Algae-X MTC 1000-LX mobile tank cleaning system is manufactured with stainless-steel plumbing, providing the same three-stage performance as the standard MTC-1000 with its traditional brass plumbing. The LX model also features cam and groove (cam lock) couplings to connect the hoses. And to prevent spillage, the cam lock fittings cap the hoses and the fittings on the system after the machine has been used. The MTC 1000-LX is primarily used to clean and restore diesel fuel, biodiesel, light oils and hydraulic fluids operating at a rate of 900 gallons per hour. The model is a good choice for companies using jet fuels. “They prefer stainless-steel components because the copper in brass can leach into the fuel,” says ALGAE-X executive vice president Bill O’Connell. All of the Fort Myers, Fla., company’s mobile tank cleaning systems operate in three stages of tank cleaning. First, the MTC removes water, large particulate and tank sludge with the separator/coalescer. In the second stage, the system reconditions the fuel as it passes through Algae-X’s patented fuel conditioner. Finally, the industrial water-block fine-filter removes dispersed and emulsified water and filters out the last, very fine solids down to three microns. The MTC operating costs are very low, because only in the third stage is the system using a replaceable spin-on filter element. Algae-X also custom-engineers and builds larger systems for higher flow rates and larger tank capacities. Both the MTC 1000-LX and the MTC 1000 retail for $6,995. Contact: Algae-X, (239) 690-9589, www.algae-x.net.